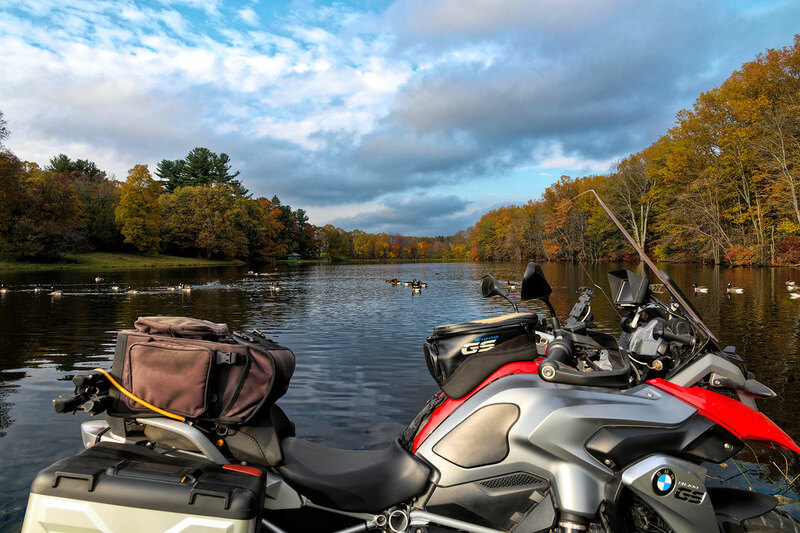 Discussion in 'Ride Reports - Day Trippin'' started by popscycle, Apr 24, 2014. This is a shot of the Skunk Train Depot in Willits Calif. The train runs from here to Fort Bragg on the Coast, about 35 miles away. Rode it as a kid with my parents, many years ago. tjzondrz, popscycle, KMichael and 3 others like this. Up Close & Personal With A FlaK 88: I found a few more pictures from last month's ride to the Battle Of The Airfield. 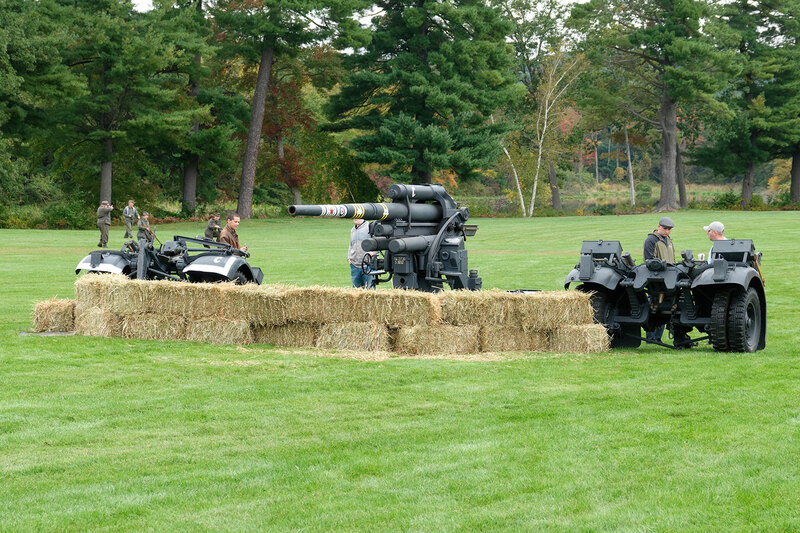 They're all of the German FlaK 88 mm gun that I was able to get closer to before the reenactment started. 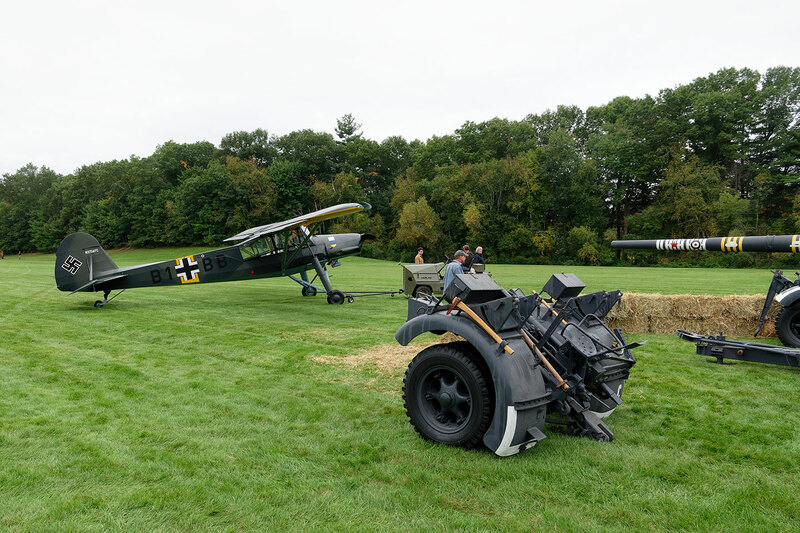 The first pic shows one of the gun's wheel carriage set against the backdrop of the Fiesler Storch. 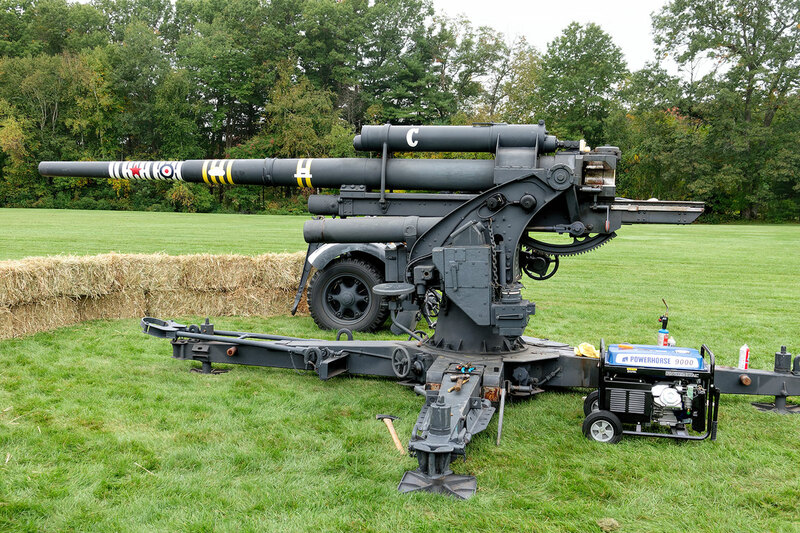 The 88 was one of WWII's most famous and feared weapons on the battlefield, used both as an anti-aircraft and anti-tank gun, it destroyed thousands of both. Some 21,000 of these were manufactured by Krupp and others. The picture below shows the 88 with both wheel sets. It may be interesting to note that it was a German 88 that almost shot down Werner Goering, an American B17 pilot who was (supposedly) the nephew of Hermann Goering. The Goering connection didn't go unnoticed by the FBI who secretly instructed Goering's co-pilot, Second Lieutenant Jack P. Rencher, to shoot Goering if he attempted to crash land or bail out over Germany or German occupied territory. Goering managed to land a badly-damaged B-17 with hundreds of holes and missing pieces. He went on to earn the DFC and fly B-47s for SAC. I think these are the last of the reenactment photos. bluestar, Deckyon, B10Dave and 4 others like this. On The Pond: Below is a fall foliage pic taken the first of this month that I just now recovered from a Photoshop crash. Forest Rooster, KMichael, MadRider777 and 6 others like this. Your photoshop crashed? Thats not good. Crashed But Not Burned: The latest and greatest version of Photoshop is not without bugs. It sometimes crashes when using certain filter combinations and settings; however, most times the images are recoverable. I mostly use PS to resize/optimize pics for the internet. Once in a while, some liberties are taken with PS to enhance/alter/play with an interesting (to me) image, such as the one below. As a general rule, though, altered pics do not get posted since the view is not genuine. In the above pic, a bunch of filters were applied to give it the very slight look of a highly detailed oil painting while retaining photographic detail. Forest Rooster, 1stgenfarmboy, KMichael and 5 others like this. That pond pic is super John. Well done my friend. The Back Trail: With so many interruptions and so much to do, I am not getting out and about much. I did, however, step out a bit and check out a somewhat controversial trail - one I said I would ride from Kevin's back yard. Shown below, the area is frozen over now but was getting a little squishy several months back and I had to turn the GS around. There's a stream back there that's not hospitable to the GS (i.e. more mud than rocks). There's been some talk of building a bridge over it; however, everyone's too engaged with other stuff to take than on at this time. That coupled with a stone wall does put a crimp on things. Anyway, turning around and walking back the way you came takes you to this structure, which is the backside of what will be our new digs. At the current rate of progress, it's looking like it will be spring before we can move it. The timing may not be too bad given that life's thrown another interesting challenge my way - learning 3-axis CNC (Computer Numerical Control) control. One of our suppliers decided the somewhat-intricate handwork he was doing was just too much and there was difficulty finding someone else to do it. So, I am stepping in to get it done on a CNC machine to be purchased. We are thinking the machine will pay for itself within a year or two and produce a better product, one with cutting/machining and laser-etched personalization. Hopefully we'll have the thing mastered and under control well in advance of better riding weather. bluestar, zookster, B10Dave and 1 other person like this. Are you going to whittle out some GS bling on the new machine toy? I am thinking Harleys seem to need bling. The GS, not so much. No German skulls or flames? On second thought that might not go over well. 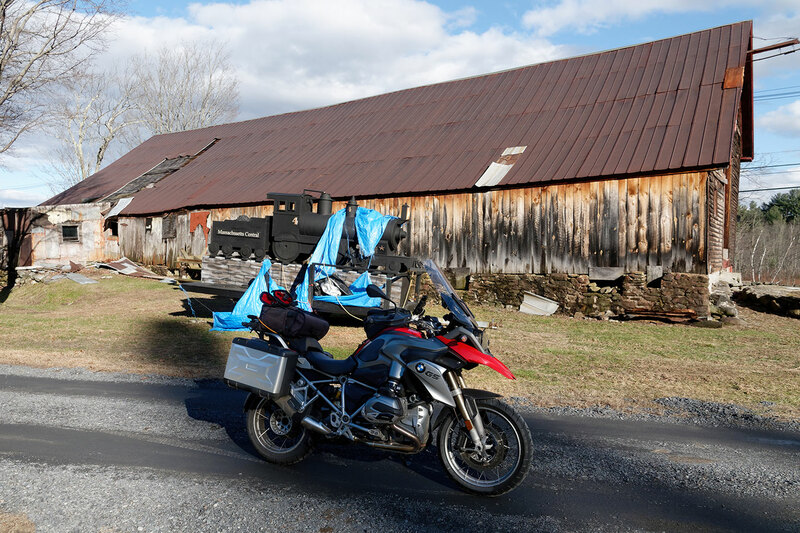 Too bad bmw never had a Wiily G.
Outback Gnarly: Here's one more pic from the trail out back (of the house). It was taken at the spot where the redhead ran out of good footing some months ago. 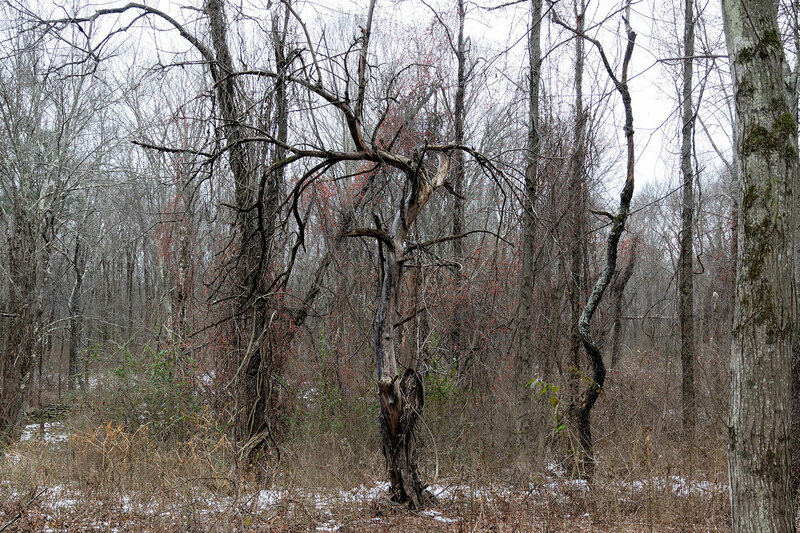 I remember seeing this gnarled tree trunk and thinking the trek was getting a bit too gnarly, not to mention stupid. 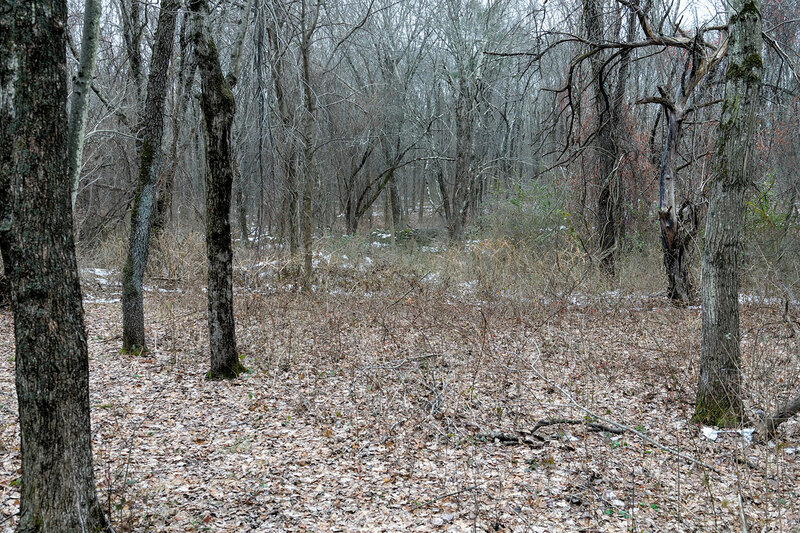 When I took the pic yesterday, I thought the tree made for an interesting image and thought seriously about using PS to fog up the area around the tree so as to make the image more spooky. I'll put that at the end of a very long to-do list. 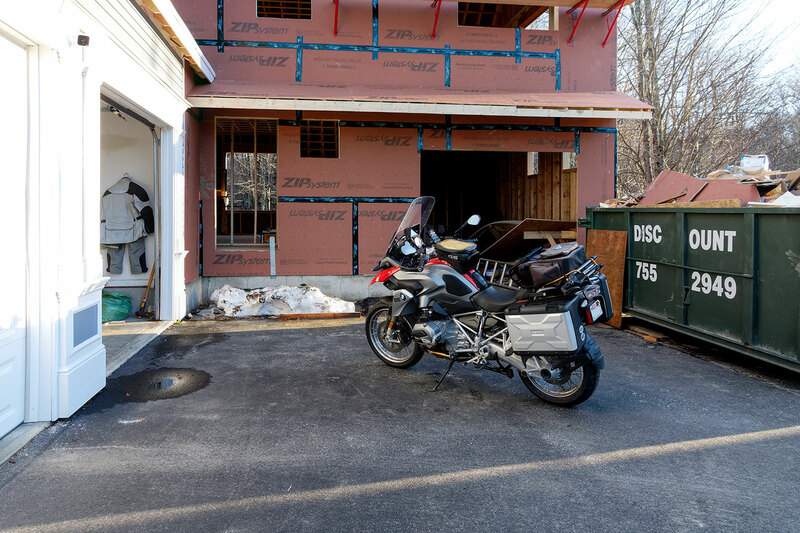 For a few moments, I did think about pulling the bike out from behind all the building stuff (e.g. a cupola on a pallet, lumber, etc.) and riding back there while the ground was hard. Being too much work for too little ride, that thought only lasted a few milliseconds. KMichael, bluestar, TheAdmiral and 1 other person like this. How about a TW200 for noodling around in the woods? I'll bet @TheAdmiral would concur. TheAdmiral, popscycle, panzer and 1 other person like this. I think both you and @TheAdmiral would be spot on with that observation. 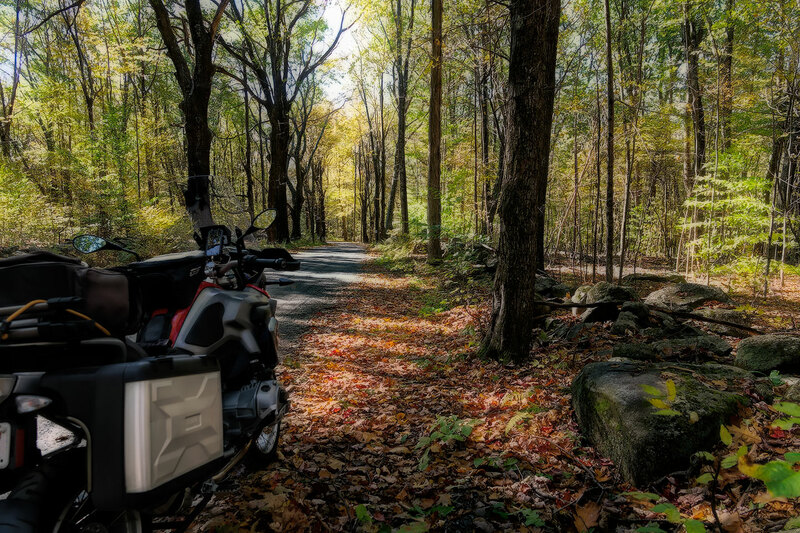 The GS is OK in dirt and gravel that isn't too technical for old farts but a bit too big and heavy for thick brush, muddy streams and/or rock walls. The last time the redhead ventured back there, I had a hell of a time getting her turned around to go back up. Stupid is a stupid does. B10Dave and TheAdmiral like this. 1stgenfarmboy, KMichael, popscycle and 5 others like this. Pretty cool, Dave. Is it kind of local, or cross country? popscycle, zookster, panzer and 2 others like this. 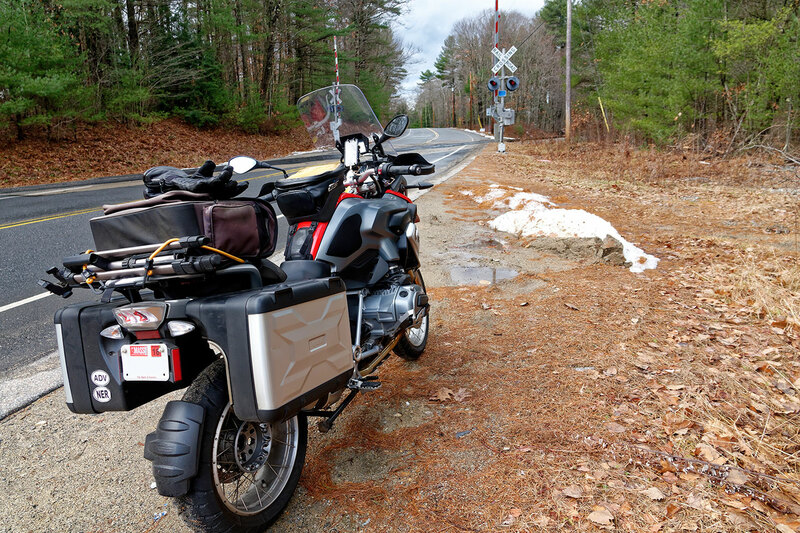 The Redhead Gets Loose: The GS finally slipped its bonds and got out today. A combination of decent weather (no rain, windy, temps in high 40s) and and the removal of lumber (i.e, being used up) from in front of the door made the escape possible. We got in an 80 mile ride before the cold set in (I still can't find my electrics, long johns or anything that would serve as a cold weather base layer). 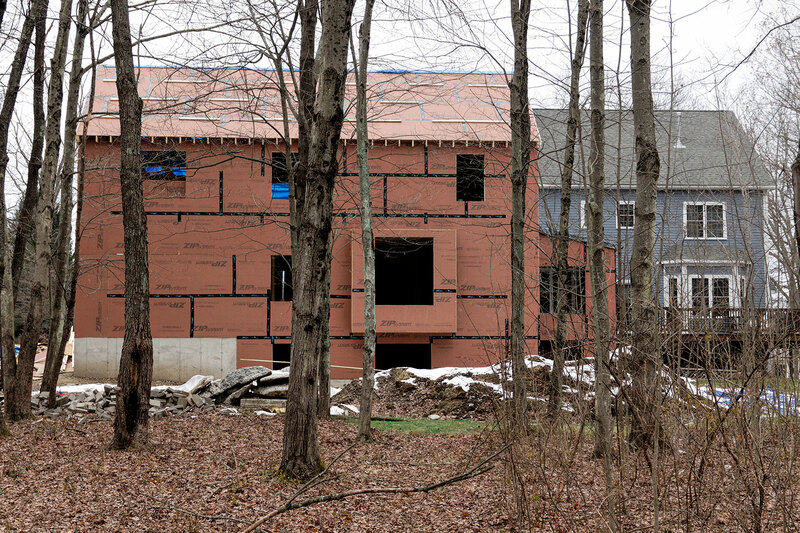 The carriage house is about 98% framed out with roofing scheduled for the middle of the week if the materials get here and the weather holds. Both roofing materials and windows were scheduled to arrive today but didn't, giving us a wide path in and out of Kevin's rather crowded 3rd bay man cave. At the current rate of progress, it's doubtful we'll make it in much before spring. The original plan, which turned out to be totally absurd, had us in by now. B10Dave, zookster, black 8 and 3 others like this. Old Church On A Cold Ride: I stopped across the street from this old (c.a. 1799) church to hydrate and warm up a bit and thought it would make a good pic with the redhead. It was about this time that I decided to limit my ride to about 20 more miles before heading back as the temp was starting to drop and the wind was kicking up. 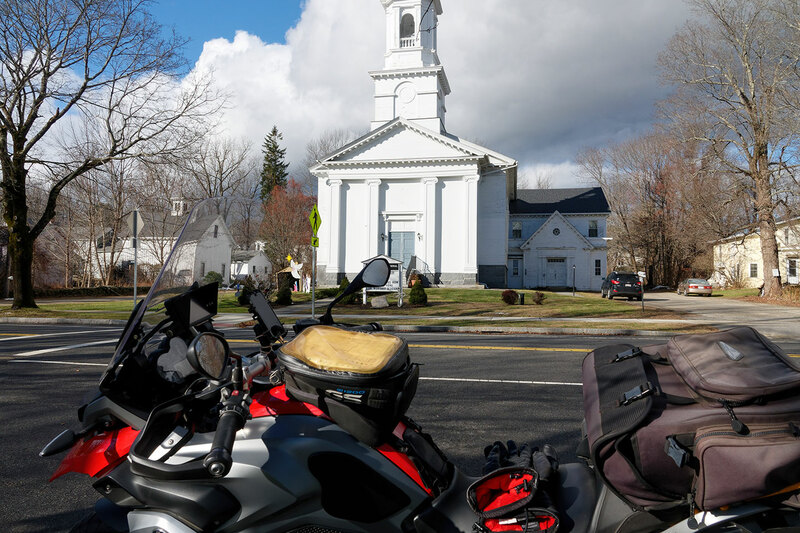 As I was converting the image from raw, I noticed the structure back to the left of the church was a classic, New England carriage house. Newventure, bluestar, KMichael and 4 others like this. The Train Behind The Barn: Going by this old barn at speed, I caught a glimpse what looked like the front end of a small steam engine. You know I had to turn around, ride up into the barnyard and investigate. Well it wasn't much of a train and the old barn's coming apart from wind and weather. Nevertheless, I thought it best to get a picture now as the old place might not survive another winter in its present form. The train's another story - one I don't yet know. TheAdmiral, zookster, B10Dave and 3 others like this. Miscellaneous Musings or A Few Notes From The Road: We are not ranging very far or wide these days, given current obligations, weather and construction duties. That said, we have gotten out for a number of quick, short runs and have some observations to share. It is now too cold to hang around waiting for a train that's supposed to appear and I've no appetite to go looking for it. The bike's good for quick trips, though. Several miles down the road from us is a rather nondescript (i.e., not picture-worthy) deli that has good sandwiches but great clam chowder, arguably some of the best I've ever had. The relative goodness and importance of N.E. style clam chowder around here cannot be overstated. Now if I could just find some good crab cakes nearby. The last really great ones I had were near the harbor in Baltimore, which is a bit far. Until we have a period of day-long temperatures below freezing, my favorite, less-traveled roads will not be fun to ride. This fall and early winter have seen a lot of rain and streams have been running at capacity up until now. it's either slick or slime. Some dry frozen would be nice. We've found a rare thing, a nearby non-chain, one-off, family-owned supermarket with reasonable prices, great variety, an even better deli counter and great meat (custom cut if you choose) that's a cut or three above the mediocre packaged stuff the chains dole out. Their custom cut and cured pepper bacon is a big hit at breakfast. Their fried chicken with a side of mac and cheese made for a tasty lunch, too. Circumstances led me to a place today where they sell many types and varieties of wood at reasonable prices. This will make my life easier as I ramp up the CNC machine for charity work TBD. This is the focus now with more on this in the near future. EDIT: I forgot to note that there's also a family-owned, non-chain hardware store about a mile away that seems to always have what I need. Just this morning I went in around 7:30, was greeted by person who helped me find the exact tools and supplies that I needed (but are buried somewhere in storage). They've a lumber yard several towns over that's supplying the kitchen cabinets for our new place. bluestar, 1stgenfarmboy, KMichael and 4 others like this.